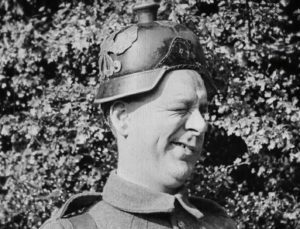 I’m the Project Officer at Kings Theatre in Portsmouth which in 2017 ran two projects linked to theatre during the First World War, made possible by grants from Heritage Lottery Fund and Arts Council England and support from the Arts and Humanities Research Council-funded project ‘Great War Theatre’. It was via the work of Dr Brooks and her team that we discovered that six WW1 plays had premiered at the Kings Theatre. In summer 2017 we re-staged one of these, Lads of the Village. For more on these projects check out this short film that was made. The stage show, a musical melodrama, was produced by Joe Peterman and written by Clifford Harris with music by James Tate and lyrics by Valentine. It opened at the Kings Theatre on 4 June 1917 and at the Oxford Theatre, London the following week. It continued touring, as far as I can tell, until 1924 with reviews remaining enthusiastic to the end. You can read more on the play here. The film was produced by Arthur Gibbons and Joe Peterman for the Atlantic Film Company, and distributed by IVTA, which was owned by Henry J Thomas. Kenelm Foss is credited as having written the scenario, and it was directed by former magician/daredevil/escapologist turned actor/director Harry Lorraine. The film is available to watch free of charge via the BFIplayer but other than general plot synopsis and that intriguing line on IMDB there is nothing on the film on-line. My first stop was the Ronald Grant Archives housed at the Cinema Museum in London, where I looked at the Kinematograph Yearbook which lists every film that had a British trade screening – it wasn’t in the 1918, 1919, 1920 or 1921 edition. Most odd! I then started going through The Cinema from mid-1918 through to the end of the 1919 looking for news stories, adverts or reviews. Nothing! Eventually I spotted Harry Lorraine’s classified ad (The Cinema, 24 October 1918) which listed Lads of the Village as his ‘latest film’. I looked in a number of other films magazines around this time, but could find no other mentions. I concluded that the film’s completion being close to the end of the war must have affected its distribution. Via the British Newspaper Archives I found, almost a year after Lorraine’s trade announcement, an advert in the Loughborough Echo (7 November 1919) proclaiming it “A Rousing Photoplay of the most successful Revue”. 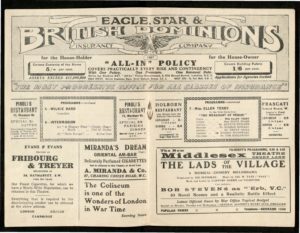 I also found that when it played at the North End Cinema in Portsmouth, it was billed as “a film version of the greatly successful Revue which was originally produced at Southsea” (Portsmouth Evening News 3 January 1920). And that’s all I could find, until the following January (1921), when former creative partners were at loggerheads in what the IMDB referred to as the early copyright case. The plaintiffs in the case were James Tate (Composer), Clifford Harris (writer) and Arthur Valentine (lyricist) of the original stage revue. They were taking out an injunction against distributor and producing partner Henry J Thomas. They claimed that their copyright had been infringed and were claiming damages and for all copies of the film to be ‘taken up’. Thomas denied infringement. Called on behalf of the defence was a Mr Joseph Peterman, the producer of both the film and stage production. In the Pall Mall Gazette (26 January 1921) he is quoted as saying that “the film version of the play could hardly be recognised as having any resemblance to the original play”. 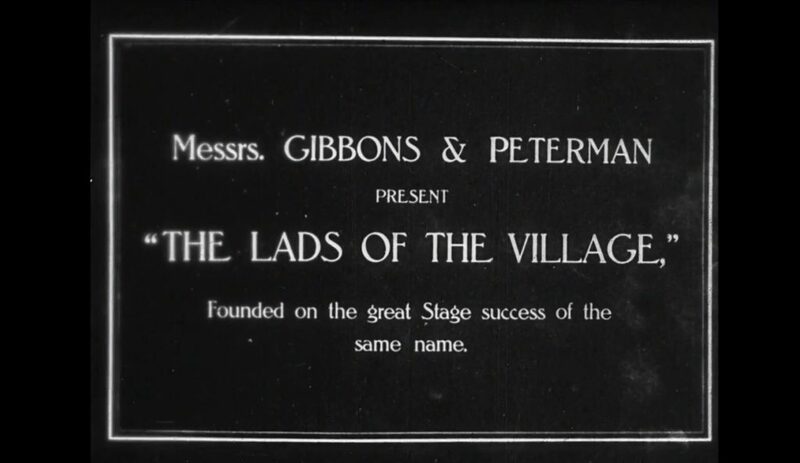 This is odd, given that the film’s title card says “Founded on the great Stage success of the same name”, and the adverts for the film all mention the stage revue. Under cross-examination Peterman added that the film version was a “diabolical failure” (Pall Mall Gazette, 26 January 1921), and claimed that he had come up with the idea for the stage play 12 months before he spoke with Harris, Tate and Valentine, and that they had merely enlarged his original synopsis (Kinematograph Yearbook 1922). … the plaintiffs owned the copyright, and the defendants had undoubtedly infringed that right. He could not hold that Mr Peterman was the author to the exclusion of the plaintiffs, or that he was joint author. He therefore granted plaintiffs an injunction, and directed an inquiry as to damages. Defendants were ordered to pay the costs down to the judgement, and subsequent costs would be reserved. Luckily for us today, all copies of the film weren’t destroyed as you can watch it on the BFIplayer. This blog is based on paper given at the British Silent Film Festival Symposium 2018 (#BSFFS18). A longer version of the Ellen’s conference paper is due to be featured on IAMHIST (iamhist.org). All content is copyright © The Great War Theatre Project, unless otherwise stated. All rights reserved.